Regular readers may recall that Ofcom recently slapped True Telecom with a fine of £300,000 for mis-selling their landline telephone services to over 100 people (here), which is on top of the £85,000 that the ICO has demanded after they caught the ISP “making illegal nuisance calls” that gave “the impression they were from BT” (here). However ISPreview.co.uk has spotted that the latest report (PDF) from the company’s Joint Administrators (T C H Ball and M I Field), which was published last week, reveals that True Telecom were already in a serious pickle before the market regulators finally took some overdue action against them. One of the biggest problems was a stalled attempt to sell part of their customer base to another telecoms operator, which was supposed to complete in September 2017 with a final payment of £1.4 million, yet this never materialised and that triggered cash flow problems. True Telecom then sought to reduce its costs by c.£100,000 via redundancies and other cost cutting exercises. Shortly after that the company’s “complex tax position [and] initial funding arrangements” (e.g. 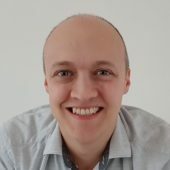 “sums withdrawn from the business by the Company’s Directors which were being treated as Directors’ loans“) is claimed to have resulted in True Telecom receiving a winding-up petition from HMRC, which was in respect of liabilities totalling £722,916 that it clearly could not settle. The business is said to have been continuing with a skeleton workforce of 16 employees (mostly customer service roles) and 2 directors. Thankfully service provision has continued without disruption to existing customers, which is vital for the administrators in order to minimise “churn” and protect the asset base / company value. In terms of the sale. Some 35 interested parties are said to have expressed an interest in purchasing True Telecom or just its customer base and apparently 14 of those proceeded to make a formal offer. The administrators state that an offer from an unnamed telecoms operator was accepted on 24th November 2017, albeit only for the customer base (due diligence for this is on-going and an announcement is expected soon). 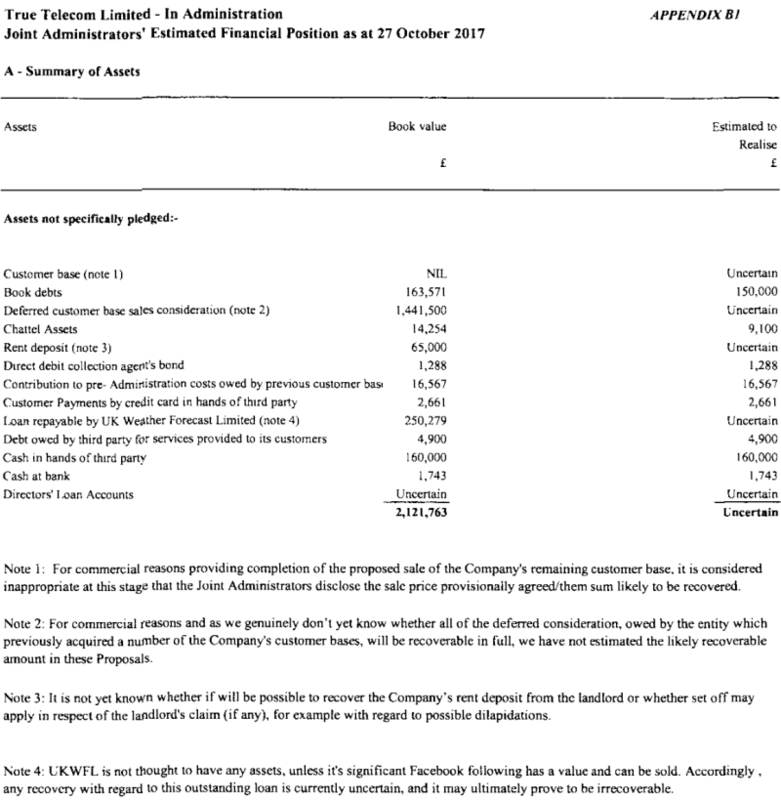 Meanwhile True Telecom is still due £1,441,500 in respect of deferred consideration owned from the previous customer base sale to another telecommunications provider, which the administrators are pursuing. Apparently this is now due to be paid in stages between April 2018 and January 2019 and if it isn’t then legal action may be pursued. The report also found some outstanding customer payments in the sum of £90,373 (possibly more relating to ex-customers), which mostly reflect historic unpaid bills from 28 customers (legal assistance and debt collectors may be employed if they fail to settle their debt). However we hope that the administrators will proceed carefully here because True Telecom didn’t exactly treat all of their customers fairly, as per the Ofcom and ICO cases. The administrators are now seeking to conclude the customer base sale as a matter of urgency, not least because in the meantime True Telecom will continue to lose money.